Anyone wanting an excellent hunting buddy or companion just shoot me a message. Here is all their info. Puppies were born October 10th. 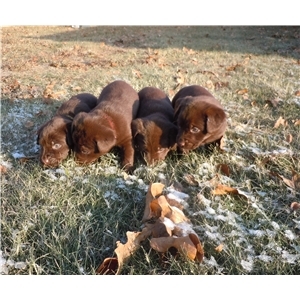 We have 3 Black Males and 3 Chocolate Females available. They will be ready to go home December 5th. Proven Champion bloodlines. Now taking deposits ($300 non-refundable) goes towards the total adoption fee. Pups will come with full AKC registration, utd shots and dewormed at 2,4,6 and 8 weeks of age. Sire: SHR Steel Rain’s Super Nova - Nova is “that perfect Lab”. His drive to hunt and retrieve is incredible. He comes out of extraordinary stock at 3 Ring Kennels with multiple hunt test champions in his pedigree. Nova is both AKC and UKC registered. He has recently proven himself in the HRC hunt test world and will only continue on from here. Aside from his high hunting drive, he absolutely loves to curl up on the couch or snuggle up in bed with the rest of the family. He loves his car rides, meeting new people (especially kids) and absolutely loves going hiking. He is a lean, mean 86lbs. Dam: Steel Rain’s River Valley - River came to us as a 13 month old started dog. Her pedigree is filled with HRC, AKC and APLA hunt champions. River competed in dock diving competitions before she arrived at our kennel and will be going for her first NADD title in the spring along with running in her first hunt tests. She is an absolute doll. River is happiest when curled up on someone and getting her ears rubbed. She is slightly smaller in stature and comes in at 58lbs. Call/text 405-308-2488. You can also find us on FB. If you call, please leave your name and number and I will get back to you asap. I can supply both pictures and pedigrees of both parents and own both. 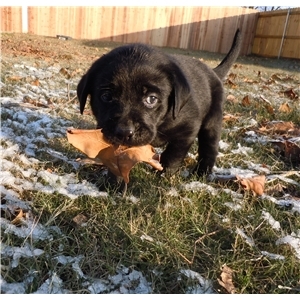 I also have individual pictures of each puppy.